Over the weekend of 2nd and 3rd March 37 players took part in the club closed Tournament (full details are in the March Newsletter and results are in the Tournaments page). The NCL held their last weekend of competition for this season (full details are in the March Newsletter and results are in the NCL page). Our teams all faired well in their various divisions. The club celebrates its Diamond anniversary this year and will be organising a weekend of Table Tennis over the weekend of 9th and 10th November 2019 at St Neots Table Tennis Centre. On the Saturday we will hold 4 competitions (to be confirmed) for all players in the North Herts TTA, Cambs and District TTL and Bedford and District TTL. On the Sunday we will hold two Elite invitation tournaments for 32 male and 32 female players. Congratulations to Heidi Oestreicher who recently won the Bedfordshire School Champion. The club annual dinner will be held on Saturday 27th April at the Green Man in Stanford. For full details of the following please see the December Newsletter. So far the club is doing quite well in the various divisions, in Premier our B Team is mid table, in Division 1 we are 1st and 2nd with our other 2 teams just below mid way. In Division 2 we currently hold the top spot and our other team is in 3rd place. In Division 3 again we hold top spot with our other teams in 5th and 8th position. In the cup finals we won Division 1, in Divisions 2 and 3 we were runners up (5-4). In the National Cadet league we are top of Division 1, In Divisions 2 and 3 we are 4th and in Division 4 we are at the bottom. See the NCL section of this website for more details. This year the club Tournament will be held on 2nd and 3rd March. It is with regret that we have to announce the passing of Ron Bent who had played for many years in the North Herts League with Settlement Ravens and then with ourselves. Finally, congratulations to our Chairman Bill Price who received a Lifetime Achievement Award, this award recognises individuals who have made a significant contribution to sport in Hertfordshire and beyond. The club has got off to a good start in all divisions (full details are in the October 2018 Newsletter). But unfortunately for the first time in the clubs history one of our teams (A Team) has had to withdraw from the Premier Division. 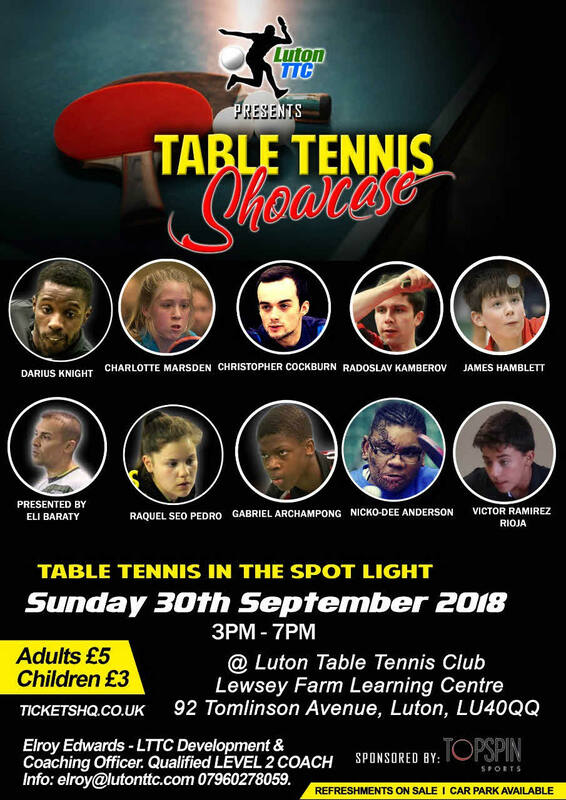 The Table Tennis Showcase held at Luton Table Tennis Club on September 30th was an enjoyable experience with good table tennis, Caribbean food and a Caribbean drum band (full details are in the October 2018 Newsletter). Isabelle Lacorte (England No 2 at U/12) finished in 25th place at the European Mini Championships held in France recently, this was an improvement from her 39th place at last years championships. (full details are in the October 2018 Newsletter). Isabelle is second from the right in this photo of the England Mini Squad. The Teams, Division structures and Match Calendar are now available on the NHTTA web site. Please ensure that you have paid your ETTA subscriptions before the season starts, else your games will be void. Your Warren Spring yearly subs are now due. Our two top boys, James Hamblett (England No5 at U/13 level), Victor Ramirez-Rioja (England No17 at U/13 level). This website has been redesigned using WYSIWYG Web Builder to provide a more responsive design across all types of viewing devices. The club will commence its summer practice evenings on Tuesday 10th July at the Great Wymondley Hall. Start time is 7.30 and cost is £3.50 per session. Junior players are welcome. Welcome to the Warren Spring Table Tennis Club Website.